The third day of Vrindavan Karthik Utsav was another splendid celebration. 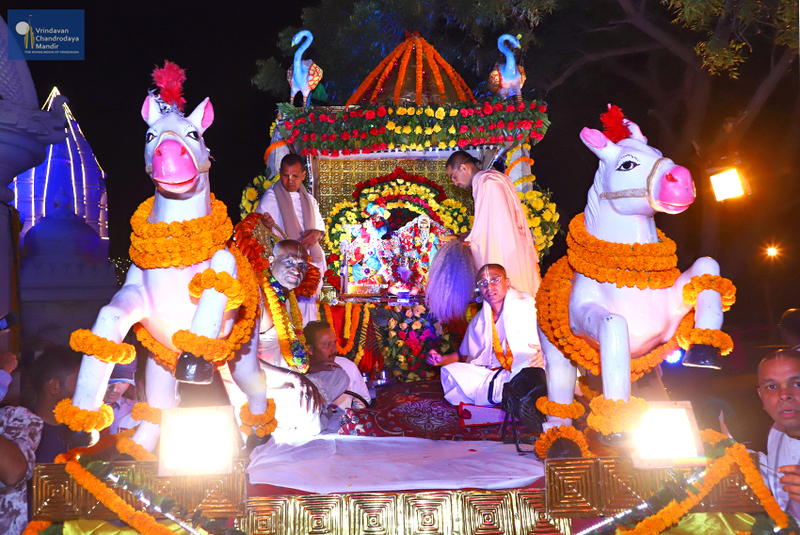 On Sunday, 18 November 2018 in the evening around 6:30 pm, the Utsav Deities of Sri Sri Radha Vrindavanchandra and Sri Sri Gaura Nitai were brought from Their Altar in a festive procession and taken on a grand chariot ride called Shobha Yatra in the temple campus. After Their Lordships had mounted Their Chariot, His Grace Chanchalapathi Dasa, President of Vrindavan Chandrodaya Mandir recounted some fascinating pastimes of Srila Prabhupada. Then the chariot procession commenced with Narasimha Kirtan. Some devotees pulled the chariot and some performed Sankirtana and danced in ecstasy. It was a devotionally surcharged atmosphere as the Deities were lovingly taken around the temple campus seated on Their majestic chariot with Sky Lanterns floating in the sky. The procession ended at the Open Air Theatre where the Deities witnessed an impressive Kathak Dance performance of Krishna Lila by Sri Arun Anand’s troupe. Then it was time for Damodara Deepotsava. Aarthi was performed for Their Lordships to the melodious singing of Sri Damodarashtaka sung by His Holiness Stoka Krishna Swami. After this all devotees offered ghee lamps to Their Lordships. Then in another ceremonial procession, the Deities were taken back to Their altar. Finally all devotees were served Mahaprasadam in the temple lawns.